Posted on May 23, 2012 September 6, 2017 by Margaret & filed under Exercise/Nutrition/Health, Growth/Inspiration, Humor, Slice of Life, Travel, Writing. Another heavenly week has come and gone. This was year 2 of my Virginia Beach writing retreat with the Doll Babies. If that’s conjuring up images of sweet, little ladies popping bon bons as they write, well, the bon bons are not far off course, but sweet…nah. If you saw us coming, you might think we were a gang. We’ve got the thriller-writing motorcycle mama, and the tattoo-covered fantasy writer. Then there’s the one that sounds like My Cousin Vinny. Ahem. Throw in a former investigative journalist, a nuclear plant engineer, and a flamenco-dancing biologist. Don’t let the two southern belles fool you. And beware of the one who induces death by chocolate every night. Scarier still, the one who cannot be bribed with chocolate cake and has some frightening ideas on revenge. You don’t want her moving those ideas from the page to the street. Trust me on this. Were we having fun yet? Hell, yeah! Long story short…I had hoped to complete another 18 manuscript pages, but I ended up with 49. Don’t ask me how. As everyone sat at their computers for hours, I got up for a snack, and then some relaxation on the beach, and then a run and shower, and then a nap. Oh, look at the time—dinner. You get the idea. Whatever works. There were moments I wanted to skip over the tough scenes and write the easier ones. But I knew I’d never have this kind of uninterrupted time again, so I forged ahead. It was a good decision. It forced me into the dreaded middle of the novel and I got some momentum going. I went down to the beach, one morning, sheet in hand. I kicked sand into a few umbrella holes, laid out the sheet, and then lay down with my eyes closed. The sound of the surf lulled me into a meditative state. A short while later, the excited screams of two women disrupted my peace. “Oh my God. Look at all those crabs.” I lifted my head slightly, shaded my eyes with my hand, and realized the women were pointing at me. My sheet was surrounded by crabs. Those umbrella holes I covered up…not umbrella holes. 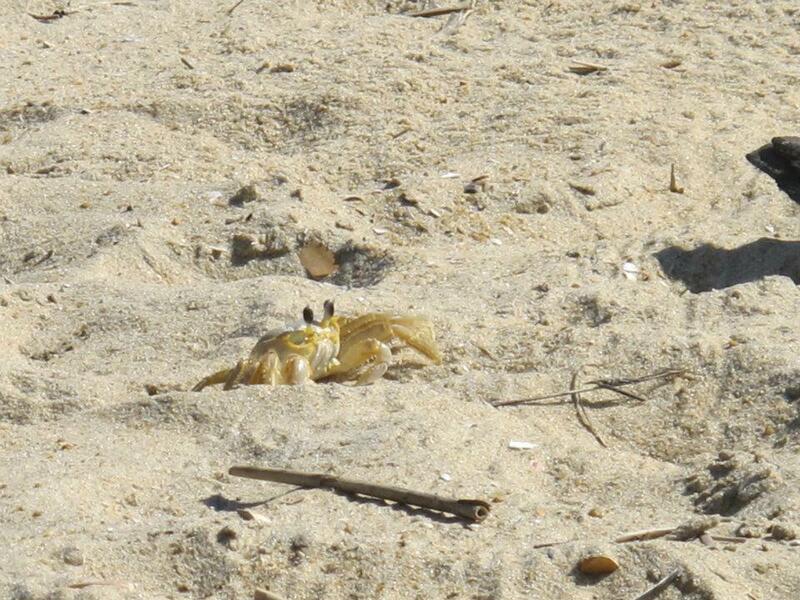 The crabs were digging themselves out of their wrecked homes. They looked angry. Some of them wielded little beach sticks in their claws. Frankly, they were menacing. I grabbed my sheet and ran. Another day, a fellow writer and I walked to a nature preserve. It was a long walk. A very long walk. It was hot. We didn’t have water. All the snack bars were closed because it wasn’t quite the season. When we arrived at the entrance booth, a friendly man gave us each a cup of water and then told us to mind the venomous snakes and the wild pi-igs. Wild pigs? Yup, those ones with the tusks. I was convinced he was having some fun with me and my New York accent. Not so. There’s something about the word pig pronounced with two syllables that scares the hell out of me. So now it’s back to the real world. Work. Bills. Chores. Not enough time to write. No worries. I’ve got memories of ten women sharing their stories, eating good food, laughing like crazy, not a care in the world. It’ll keep me going until next year. A strong suggestion for my readers: Do this for yourself. You don’t have to be a writer. Carve out a week with like-minded people. It’s food for your soul. I didn’t know pigs could have two syllables. It sounds like the best retreat ever. Last year’s was perfection. Apparently there’s a step beyond perfection. Crabs notwithstanding, sounds like a worthwhile retreat. And I say pork is pork no matter how many syllables you use to pronounce it! Are you alive and 49 or alive with 49 unfinished pages ? Hey it seemed like you had stopped blogging for a long time. I have re subscribed. LOL. None of the above, Carl. I’m 46 (for about 2.5 more weeks 😉 ) and a heck of a lot farther than 49 pages from the ending. I hit 63 June 18 so we must be close. This sounds so amazing, Margaret! I go on writing retreats with my blogging partner Leslie – but we never dared take a whole week! What a wonderful idea, and congratulations on 49 pages – that would take me about a year! Thanks, Deborah. You should definitely dare to take a week next time. Real life just melts away and you get into the groove. Sounds heavenly! I’d be happy to do this and not write a single page. True. But there’s something fun about the energy buzz in the room when you have that many people sitting together writing. I hope you can keep the momentum going, Margaret. Just to be clear: this was a retreat, not a workshop, right? I’ve been trying to find something for this summer. I need to be away, but I don’t want to spend a lot of the time traveling. And if there are poisonous snakes in Virginia Beach, it definitely won’t be there. That crab looks pretty friendly! Sounds like a great retreat…you so deserved it and obviously got the benefit too. Indeed, I did. I can’t wait till next year.